The UN fleet approaches the Ring. The crew and passengers of the Thomas Prince look at Manéo’s final video. They are trying to determine what happened to him and what the Ring is. The chief scientist Kolvoord (Chris Owens) offers his analysis. He asks Reverend Doctor Anna Volovodov (Elizabeth Mitchell) a snide question. Kolvoord: “What do you think pastor, has your god reveled himself?” Anna: “Well I don’t know, but if we are going to meet God, as a bunch of angry fools, we should turn these ships around and go home.” James Holden (Steven Strait), still shaken from his encounter with Joe Miller (Thomas Jane), gets a call from Amos Burton (Wes Chatman) to watch the Manéo video. Alex Kamal (Cas Anvar), Amos, and Holden watch the video while Monica Stuart (Anna Hopkins) and Cohen (Brandon McGibbon) linger in the background. Alex: “G-damn Ring woke up. I do not think it was too happy about being poked in its sleep.” Holden can’t take it and bails, he tells Monica to interview Alex. Alex asks Monica does she find it odd we’re at the Ring and its knocking? Aboard the Behemoth, Camina Drummer (Cara Gee), Klaes Ashford (David Strathairn), and Naomi Nagata (Dominique Tipper) watch the Manéo video. They are sure that the Inners will blame the OPA for his actions. Naomi: “And if something miraculous happens, they’ll plant their flag on it.” Drummer: “And go back to murdering each other.” Ashford could care less what the UN and Mars think. On board the Seung Un, Melba Koh (Nadine Nicole) wakes up and finds Ren’s (John Kapelos) dead body. She remembers that she killed him. She panics at first, but she is able to steady herself and uses part of her uniform to clean up the murder scene. She tries to put him in one of the ship’s vents, but he doesn’t fit. Accessing her increased strength, she smashes his head in so that he can fit. After she stuffs him in, she reconnects the bomb. Ashford joins Drummer and Naomi with three glasses and a bottle of booze. First, he offers a toast to Fred Johnson and Dawes for telling Chrisjen Avasarala that the Belt will join everyone else at the Ring. He then offers a toast in honor of Manéo for entering the Ring first. Ashford: “And to our foolish and fearless young rock hopper, who sunk his teeth deep into the unknown, for love.” Naomi and Drummer drink to that. Ashford keeps talking about how Manéo’s act is the type of sprit the Belter’s used to settle space. Drummer doesn’t remember Ashford being so talkative before. She grabs the bottle and leaves. Amos catches Cohen fooling around one of the Rocinante’s control panel. Cohen tries to pretend his blindness gets him confused and he wanders around. Amos offers to put him on a treadmill. Cohen flirts with Amos again and Amos shuts him down. Holden is in sickbay running a series of test on himself, including a Protomolecule scan. Melba is back on the skiff heading back to the Thomas Prince. Stanni (Ari Miller) wonders where half her uniform is and jokes that she and Ren must have gotten it on, but he decides that’s too silly, an old man like Ren couldn’t get a young woman like Melba. He decides Ren is somewhere aboard the Seung Un sleeping it off. Melba tells him to shut up. She starts thinking about what she did to Ren and starts crying. She doesn’t notice she is going to crash into the Thomas Prince. Stanni is able to grab control of the steering device and avoid collision. He chastises her for nearly killing them. 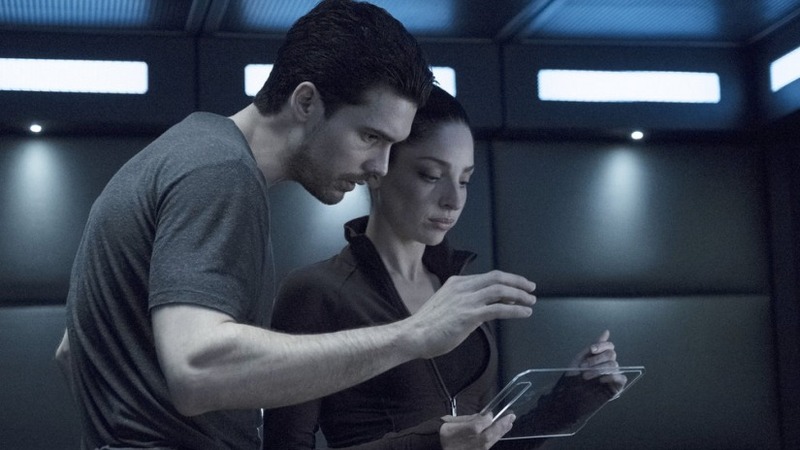 Holden looks at the results; his Protomolecule scan is negative. Miller pops up talking gibberish. Holden can’t understand it; his medical tests show that nothing is wrong with him. He can’t understand why he is seeing Miller. Holden talks to him to try to find out what is going on. Holden: “What’s with the hat?” Miller: “It keeps the rain off my head.” Miller keeps talking about one of his old cases. Holden: “Why are you telling me this?” Miller: “I’m supposed to think about this. Ah this could mean something.” Holden starts screaming at Miller and he turns around to see a shocked Amos staring at him. Holden: “That may have looked weird.” Amos: “Hey, none of my business. Are you sick Cap?” Holden: “No, I don’t think so.” Amos: “Look, if there’s anything you need to get off your chest, I’m not much help, but I also don’t judge.” Holden: “That’s a great quality you know.” Holden assures Amos he is all right. After Amos leaves, Holden looks at a recording of the room to see if Miller was actually there. He isn’t in the video. The Reverend Doctor Hector Cortez (Paulino Nunes) is holding court at the dinner table aboard the Thomas Prince. He is sprouting deep sounding platitudes about the Ring and God. Anna and Tilly Fagan (Genelle Williams) listen in amusement. Tilly talks about how her family does business with his megachurches in Africa and Asia and make a nice profit from it. While she talks, Anna notices Melba sitting by herself looking distressed. She excuses herself and catches up with Melba. Anna: “Excuse me. Are you alright? Do you need something?” Melba thinks for a moment, clearly mulling it over but says, “No,” and she walks away. Back at the Rocinante, Cohen is looking at some footage he recorded of Holden. After listening to Holden talk about Naomi, Monica asks Holden why he called for her. Meanwhile Amos talks to Alex about Holden. Amos: “He was having a full on conversation with himself.” Alex: “Who doesn’t talk to themselves now and then?” Amos: “Me!” Amos tells him that Holden is running medical tests on himself, including a Protomolecule scan. Alex becomes worried, but Amos tells him it was negative, but he’s run the same scan 35 times. Alex is afraid Holden is losing it like the XO of the Canterbury did in the pilot episode. Cohen takes out a computer chip out of a control module and replaces it with another one. Holden asks Monica who has a Masters in Psychology if a person’s concerns can manifest themselves. She asks what he means. As he tries to explain himself, Monica mentions coincidence. Holden gets an idea and asks to look at her recording with the timestamps after Manéo went through the Ring. Miller first showed up the same time. He hustles a confused Monica out of the room. Holden frantically calls for Miller telling him they can’t help him if his ship is destroyed. Alex is ready to try to outrun everyone. Miller finally shows up and says, “If you go into a room too fast, kid, the room will eat you.” Holden understands what Miller is saying. The Behemoth fires a missile at them. Holden runs back up to the bridge and gives Alex these instructions. Holden: “You need to go for the Ring. Slow the Roci down. Flip and burn her as hard as you can without that missile catching us.” Alex: “We are dead if I slow down.” Holden: “It’s a risk we got to take… Massive decel right before the Ring.” Amos: “How do you know all this about the Ring?” Holden: “Because Miller told me. [Amos looks at Holden like he’s crazy.] I can’t prove a g-damn thing, but this is our only way out.” Amos: “Alex, do what the Cap says.” Alex slows down and heads towards the Ring. Drummer: “They’re going for the Ring.” Anna: “In God’s name, what are they doing?” Someone says they’ll be dead. The missile is near the Rocinante and they enter into the Ring. Everything goes to black…and then Holden wakes up with a few blood droplets floating from his nose. The Rocinante is in the Ring, but so is the missile. Things appear normal amongst the ships heading towards the Ring. The Thomas Prince scientist are still trying to figure out what the Ring is and Kolvoord gives attitude to Anna, who won’t take it from him. Outwardly, Anna is peaceful and serene, but inside her is a fighting spirit. She won’t back down to anyone. They should ask Errinwright about that. On board the Behemoth, Drummer and Ashford continue their verbal sparring. They put aside the hostilities for a toast to Manéo. We don’t know what the Martians are doing this episode. Things are normal on the Rocinante, their normal state of batshit crazy. Miller keeps visiting Holden talking gibberish. Holden thinks something is wrong with him, but his extensive medical tests show that nothing is physically wrong with him. Amos and Alex notice his strange behavior and think he’s cracking up. The crew is too busy to notice that Cohen is sabotaging the ship. On board the Thomas Prince, no one notices what Melba is doing. She’s acting strange, Anna notices, but they have no idea what she is up to. Melba blows up the Seng Un and frames Holden for it. Using the video he has recorded for the documentary, Cohen creates a video of Holden taking credit for the explosion. He also tampered with the Rocinante’s comms and weapons. They can’t tell anyone they didn’t do this, nor can they defend themselves. Since the video of Holden claimed he was doing this for the OPA, the Behemoth fires a missile at the Rocinante, to keep the UN fleet from attacking them. Naomi can’t get anyone to listen to her. If Drummer had more time, she probably would, but with only a minute to act, she does what anyone in her position would do. Holden is able to get Miller and in a cryptic sentence, he tells Holden what to do. Holden has Alex slow the Rocinante down, entering the Ring. They are the first humans to enter the Ring… alive. How long they stay that way is the question. This was a really good episode, especially the last 15-20 minutes when all hell broke loose after Melba blew up the supply ship. I liked the way they had the different crews react to the same incidents. The banter and bickering between Drummer and Ashford is very funny. I don’t have a read on Melba yet, I know she is crazy and has a vendetta against Holden, but that’s all so far. I wonder where she got that super strength. The Roci crew was great as usual, especially the interplay between Amos and Alex. It’s great having Thomas Jane back on the show, and Miller’s interactions with Holden are fun and intriguing. The last 20 minutes of the episode were some of the tensest moments the show has ever had. I was on the edge of my seat the entire time. The season just keeps ramping up.